Antoine-Laurent Lavoisier was born in Paris in 1743. His forebears had done well in the law over several generations and by this time the Lavoisier family was well off. Antoine, who demonstrated great intellectual prowess at an early age, enjoyed the best education that was available in France at that time. He attended the College Mazarin, the only school in Paris which taught sciences and mathematics as well as literature and history. It was this originality which determined Antoine Lavoisier's destiny to become the founder of modern chemistry. It had taken a Newton to clear away the massive intellectual barriers, which Aristotle and the medieval scholars had erected through their misunderstanding of the nature of inertia, to reach an understanding of celestial and terrestrial mechanics. Similarly it required a Lavoisier to throw over the phlogiston theory of combustion in order to establish the existence of oxygen, the nature of oxidation processes, (in particular the way in which carbon was oxidised, in combustion, to become carbon dioxide) and the reverse process to oxidation, that of reduction of oxides (metallic oxides particularly) to their constituent elements. He achieved all this through his insistence on the precise measurements of the materials he used in his experiments, and his capacity to think through the fog of the phlogiston theory which bedevilled the understanding that the chemists of the day brought to their experiments. Although there were many chemists in England, Scotland and other parts of Europe who played a part in bringing down the phlogiston theory, Lavoisier was pre-eminent both in his experimental ingenuity and in the boldness of his theoretical speculation. As well as devoting considerable time and energy to his career as a scientist, Lavoisier played a very active role as a civil servant and taxation official. This latter role enabled him to make a substantial fortune, and he spent much of this wealth on his scientific activities. He was asked to advise the Court of Louis XVI on tax issues and economic policy more generally, and he identified with the anti-protectionist party of the day in advocating the elimination of barriers to trade both within France itself and at the borders. He was also asked to advise on the sewerage and water supply problems of Paris. I denounce to you the coryphaeus---the leader of the chorus---of the charlatans, Master Lavoisier, son of a land-grabber, apprentice-chemist, pupil of the Genevan stock-jobber Necker, a Farmer General, Commissioner for Gunpowder and Saltpetre, director of the Discount Bank, secretary to the king, member of the Academy of Science, intimate of Vauvilliers, unfaithful administrator of the Paris Food Commission, and the greatest schemer of our times. Would you believe that this little gentleman who enjoys an income of 40,000 livres and whose only claim to public recognition is that he imprisoned Paris by cutting off the fresh air with a wall that cost the poor people 33 million livres and that he moved gunpowder from the Arsenal into the Bastille on the night of July 12 and 13, is engaged in a devilish intrigue to get himself elected as administrator of the department of Paris. By 1794 the Left had captured power, the King and Queen were executed, and Lavoisier lacked the political sagacity to realise that his own life was in danger. He was sent to the guillotine on 8 May 1794 by the Revolutionary Convention. 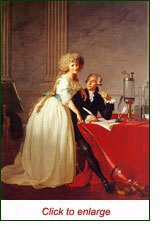 Monsieur Lavoisier and his Wife by Jacques-Louis David, 1788, courtesy of CGFA. Click above for latest SOHO sunspot images. Click here for David Archibald on solar cycles. Where is that pesky greenhouse signature? Click here for David Evans's article. Website designed and powered by Fergco Pty Ltd. Copyright in the materials on this site resides with The Lavoisier Group Inc.